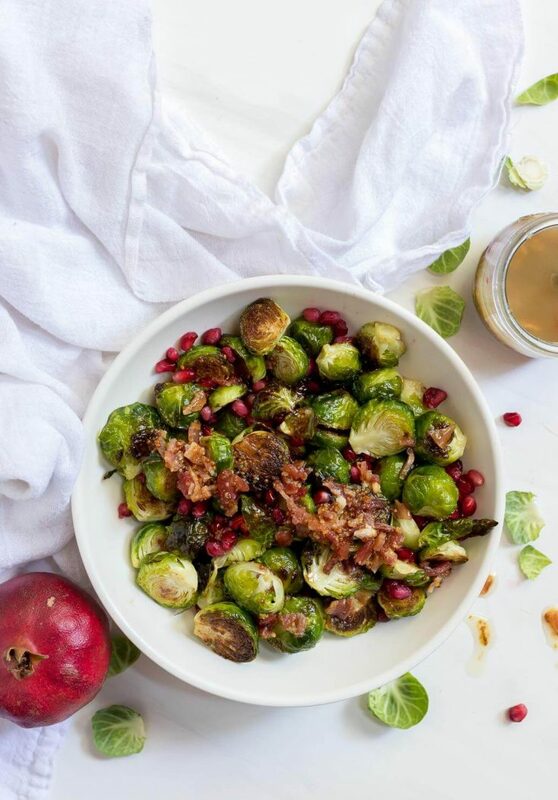 Brussel Sprout Salad with Warm Bacon Dressing and Pomegranate is just what your holiday dinner needs. 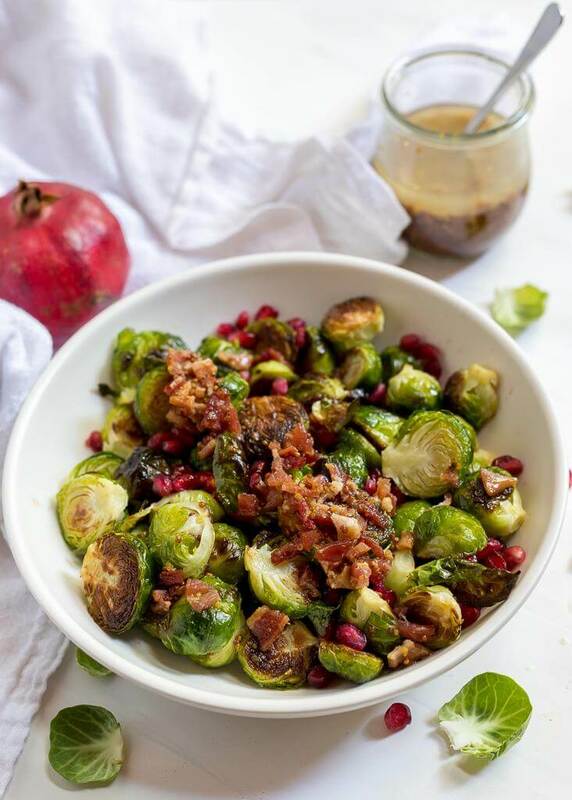 The earthy Brussels sprouts, sweet pomegranate and salty bacon vinnaigrette are the perfect combination. This side dish recipe will be a new family favorite. How do you make Roasted Brussel Sprout Salad with Bacon Dressing and Pomegranate? This Brussels Sprout Salad Recipe is a very simple side dish. Just get those Brussels sprouts roasting and make this WARM BACON DRESSING while they are in the oven. Once done, toss together and add the pomegranate seeds. That’s it. I was surprised when I asked folks on Instagram what types of holiday recipes they wanted. I received a ton of requests for Brussels sprout recipes. I guess it surprised me because at my house I am the only Brussels sprouts fan. I love dishes that have a variety of flavors and textures. 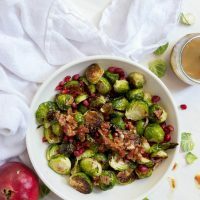 This Roasted Brussel Sprout Salad with Warm Bacon Dressing and Pomegranate has earthy, sweet, salty, tender and crisp. Basically it has it all! Roasted. All. The. Way. I don’t eat them any other way. In fact, if you hate Brussels sprouts I would guess that you may have not tried Roasted Brussel Sprouts. 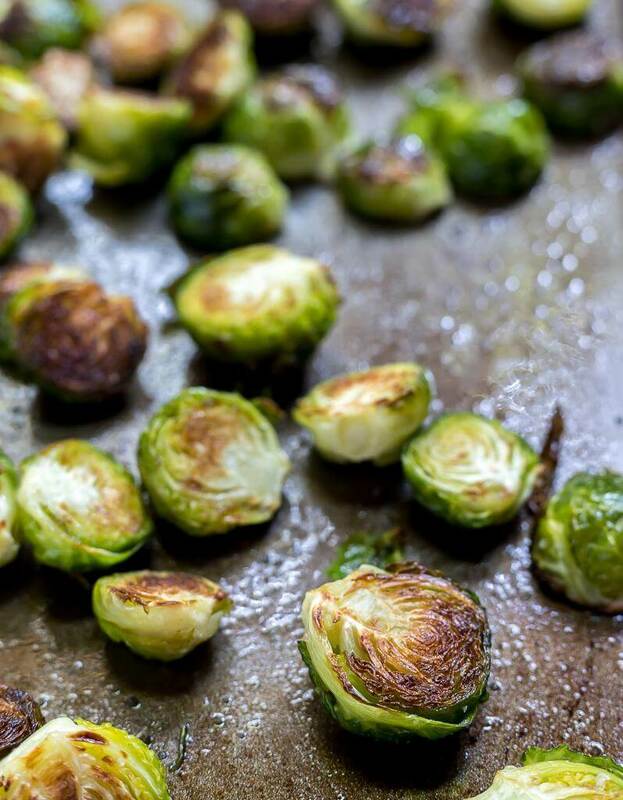 Pan fried in a scorching hot skillet is a good way to cook them up if you aren’t into oven roasted brussel sprouts. Steamed or boiled sprouts are just awful. Mushy, soft, blahhhh. Coat brussels sprouts with oil. Sprinkle with salt and transfer to a rimmed baking sheet. Roast for 15-20 minutes or until browned and tender. Flip half way through cooking time. 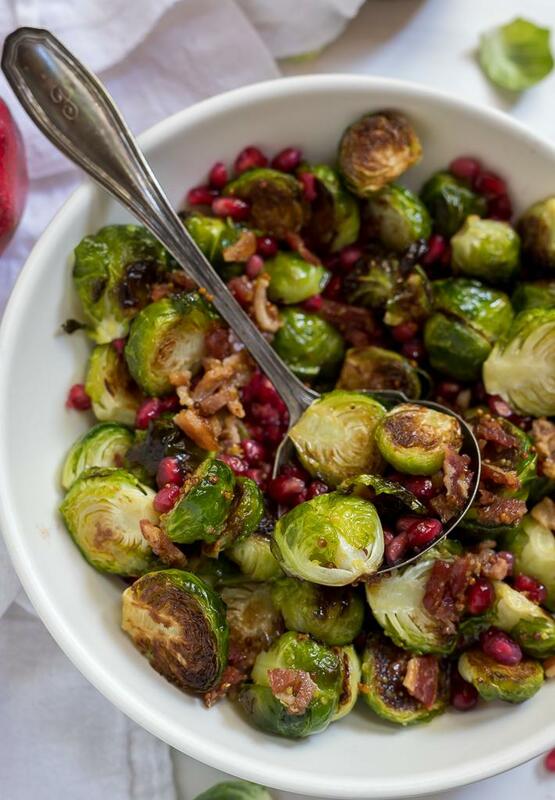 Toss roasted brussels sprouts with pomegranate seeds and warm bacon dressing before serving. This recipe serves 4, double or triple for a large holiday gathering. This salad can be served hot or room temp. Do not serve cold because the bacon drippings in the dressing will thicken.